Heidi took me to see Shonen Knife on Sunday. It was the last show of the Australian tour to promote their new album “Super Group“. The new Shonen Knife line-up seem to have a great rapport and exuded a very fun and friendly vibe – which perfectly complements their music. It was smiles, head-banging, group poses, and reaching out to the crowd. The brief stories thrown in offered insight into inspiration for some of the songs (not that meaning is usually deeply hidden in their music!). 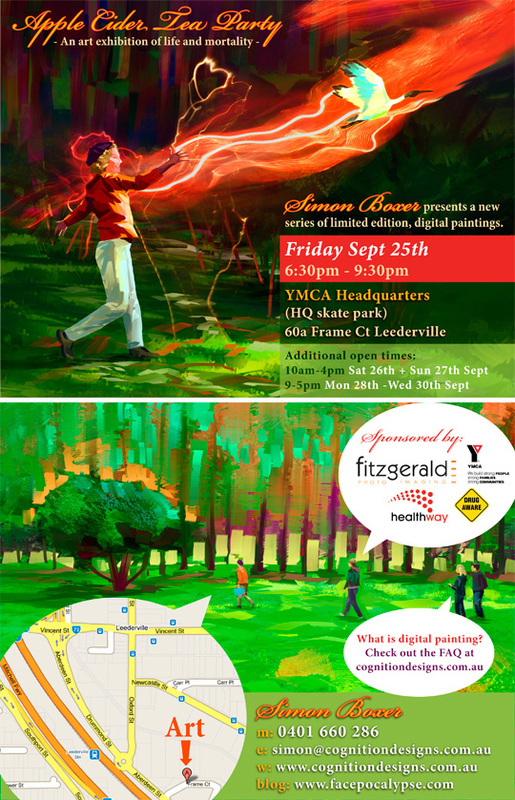 Simon‘s first solo art exhibition, entitled “Apple Cider Tea Party“, is on from 6:30pm tonight at HQ in Leederville (the YMCA building next to the skate park near the train station; it’s the same venue as our joint exhibition back in May). He’s been promoting it pretty hard on facebook and his blog (and he’s got some coverage in print media), but I figured that another reminder from me couldn’t hurt. I also wanted to share a few thoughts on creativity, art, and self-direction. To me, the greatest thing about Simon’s art is that he’s able to express very raw, honest, and unpretentious reflections of both himself and what he’s trying to capture. His work is explosive and colourful, but also balanced and thoughtful. He manages to de-construct his subject matter with natural immediacy – rather than prolonged and exhaustive introspection that whittles away at the soul of the work. Birds? Lightning? Berets?! Hive 5s!!! FREE?!?! going to stop by twice ON THE SAME NIGHT! Overzealous? Possibly. Disingenuous? Not at all! I honestly cannot recommend this exhibition enough. It will be unlike anything you have ever seen, and you should definitely do whatever you can to make it down tonight or over the weekend. 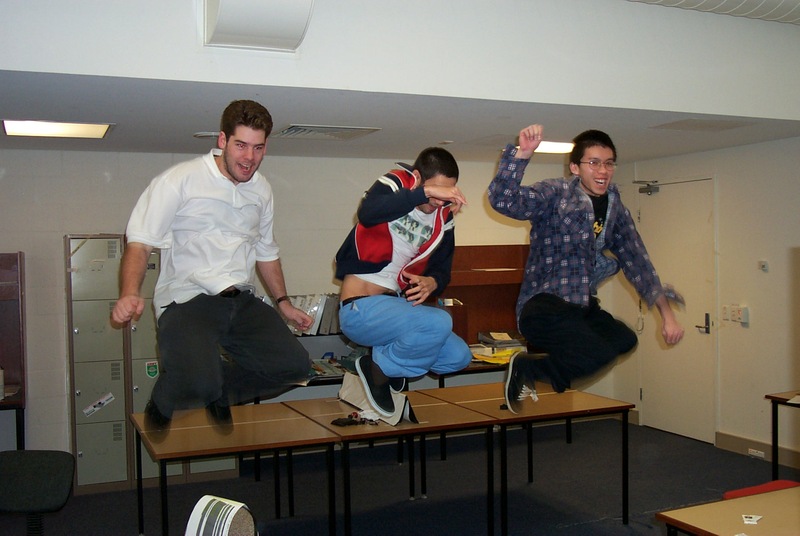 Way back in the year 2000, I was completing the honours year of my Bachelor of Computer and Mathematical Sciences degree at The University of Western Australia. It was a fantastic year! Fortunately, most of the highlights are chronicled in (photo, video, games, and article) contributions to an “Honours CD” which served as a sort of digital yearbook. I recently found my copy of the CD and promptly backed it up to my trusty NAS. Aw yeah – check out the sideburns! It feels so infantile now. Hahaha, I”m sure it was back them as well! The CPU is 9x faster than my old one and the GPU is 16x faster than my old one (according to Passmark). I tend to agonise over potential purposes (since I don’t like wasting resources by getting something that I won’t use). In this case, I made a spreadsheet with a bunch of possible computer configurations and their respective prices. I noticed that even a (quiet, low power) basic system gets me a massive performance increase, and that performance gains reduce quickly thereafter. 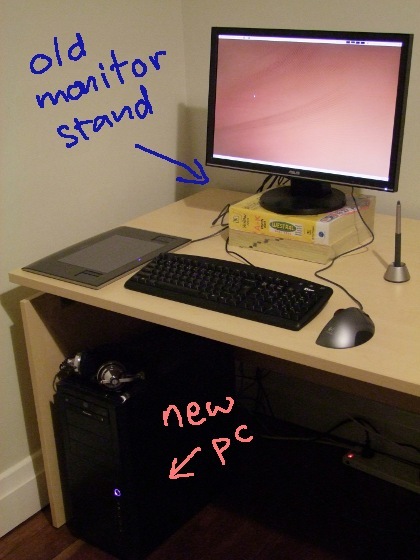 Unfortunately, they couldn’t tell me if the graphics cards was a low-power (59w) version; turns out that it isn’t. Overall, I’m very happy with the purchase. It’s nice and quiet, everything is much more zippy, and there are no compatibility problems with Ubuntu. I used some of the money I saved to buy a new tablet (6″x4″ Wacom Intuos3 for $277, discounted now that the Intuos4 is out). You have a deadline to clear unnecessary things out from your house. Most things get picked up by other people before the rubbish collection people come along. We’re moving house in a little while and want to minimise what we take (or put into storage). So we had a few things to put out including: a desk, inline skates, exercise weights, an easel, and some motorcycle helmets. We’re also gone through most of our things and we will be donating a few more items, and possibly putting some up for sale online (a couple of bikes, a Commodore 64, a bunch of DVDs and games). 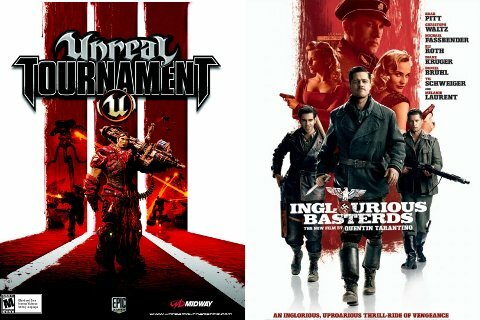 Inglourious Basterds poster reminiscient of Unreal Tournament 3 cover art? Author NickPosted on Friday, 18 September, 2009 Friday, 18 September, 2009 Categories General1 Comment on Inglourious Basterds poster reminiscient of Unreal Tournament 3 cover art? Jim got a copy of the old 60Hz CVS repository on CD-ROM and wanted to put some of the old projects on the OneTwenty SVN server. The entire process was pretty easy using cvs2svn. We migrated the Clean Rendering Libraries first. It seemed the easiest one to transfer since it’s just a bunch of text files (no binaries). This promoted a single project within the CVS repository to be the main line of a new SVN repository. Which seemed like the thing to do, since the 60Hz projects are pretty loosely coupled. Install the Feed Facebook, Leave Facebook plugin to create a custom RSS feed (with brief article text and a link to the original article). Follow the instructions in this WordPress.tv video, but use the above custom RSS feed rather than your normal article feed. The only real shortcoming is that the blog posts won’t appear immediately since you have to wait for Facebook to check for feed updates (maybe every couple of hours or so) before they will appear in your profile. Importing your main article feed usually means that the full text of your articles appear on Facebook. A partial (excerpt) feed means that interested readers visit your website for the complete article. When importing feeds into Facebook, it isn’t always super-clear that the source is an external website. This technique adds “[…]” (to indicate that there is more) and a “Read the rest on my blog” (to show where it came from). There are other plugins that post immediately, but they must do so via your Facebook account (so you need to provide them with your account details). I don’t know, this seems potentially dangerous. I’m not really that big on Facebook. I view my blog as a sort of personal journal, and I’d prefer to have comments and conversations here so that I look back on them in future (and not lose them if/when Facebook is no longer “the” major social networking site). Note: Sorry if you find these photos a little gross! I’m not sure what to do with them (or rather I don’t really want to do it). I’m fine with killings things when they are injured, but Mao brings them in alive and (generally) unharmed. On the other hand, it’s bad to release them anywhere in Australia (they’re pests in both urban and rural areas). We definitely don’t want them multiplying further. Whoa, Mao found another one while I was writing this post! She didn’t catch it though. 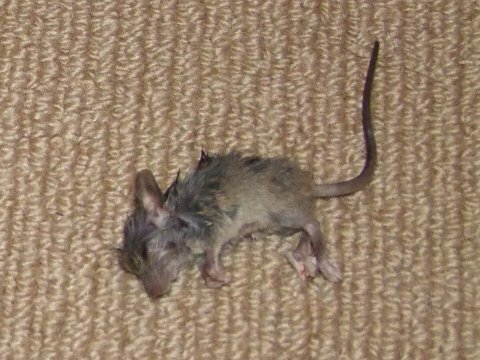 Blech; it’s an awful feeling knowing that there’s a mouse crawling around your house somewhere. Update: Moa caught the forth one. I imagine that there’s probably more. Not too concerned since I don’t see them bothering us much with Mao around. Update: Five. I also heard some giddy screaming from the neighbours – maybe they have seen mice as well. Update: Six? Six!?! This is nuts. Update: NINE!?! Is this for serious? 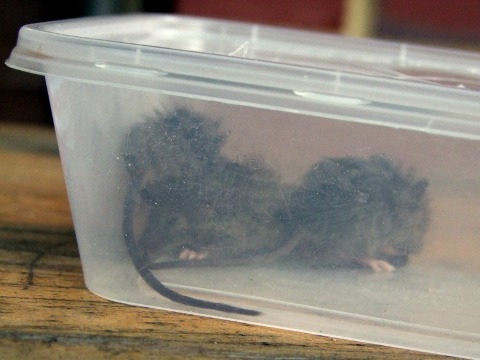 Looks like some sort of infestation – but then again, Mao brings them in from outside. I took these photos at a garden on Jeju Island in Korea. The soft white lines are from the wire fence.